On February 24, 2012, China won the 13th Nongshim Cup when Xie He 7P defeated Lee Changho 9P in the final game. The Nongshim Cup is a win and continue team event between China, Japan and Korea. The first two rounds took place in late 2011. Young players Tan Xiao 5P of China and Kim Jiseok 7P of Korea emerged as the early stars of the tournament, both winning four consecutive games. After eliminating Tan Xiao, Yamashita Keigo 9P, Piao Wenyao 9P and Gu Li 9P, Kim Jiseok was finally stopped by China’s last man standing, Xie He. Next Xie defeated Won Seongjin 9P and finally Lee Changho, to bring the Nongshim Cup home for China. Congratulations Team China. Jingning; based her original article China wins 13th Nongshim Cup at Go Game Guru. 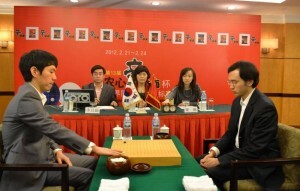 Photo: Lee Changho 9P (left) plays Xie He 7P in the final game.